Melissa Waugh talks about her life as a mother taking care of her two hyphenated kids as well as being a part-time lawyer specializing in special education law. Judge Wilhelmina Wright shares her advice to any young, aspiring judges about building confidence, taking responsibility, and overcoming barriers in their careers. Betsy West and Julie Cohen discuss their movie, The documentary RBG, as well as what makes the film unique, why they chose the subject, and what makes Justice Ginsburg worthy of her own documentary. Carl Hernandez talks about the immigration clinic at Brigham Young University, which is managed mainly by students and meets a great need in the Utah community which has a large immigrant population. Benjamin Davis shares his personal experience as a law professor and how law students can foster relationships with their professors. Learn about the new ABA Law Student Podcast host John Weber in this episode of the ABA Law Student Podcast. Tune into this law student podcast featuring Thomas Kim, the new chair of the ABA’s Law Student Division. ABA President Linda Klein discusses the history of Public Service Loan Forgiveness, a program to entice young lawyers to take public service positions. ABA President Linda Klein talks about the Public Service Loan Forgiveness program and how it has fallen short. Carl Douglas, one of the defense attorneys in the O.J. Simpson case, talks about the case and the circumstances that lead to the controversial verdict. Sheila Hollis and Barbara Bavis discuss the Law Library of Congress and the many resources it offers. Continuing Education of the Bar Executive Director Kelly Lake discusses disruptive effects of legal technology and why continued learning and development is essential for legal professionals. Washington state trial attorney Mark Vovos discusses his journey toward trying death penalty cases and the challenges involved. Andrea Kramer discusses her new book, Breaking Through Bias: Communication Techniques for Women to Succeed at Work, and gender equality in the workplace. General Jack Rives, ABA executive director, discusses his career as a military lawyer, his transition to civilian life, and his current ABA role. Brooks Brothers District Manager Mic Clark discusses wardrobe elements that every lawyer should have. ABA Young Lawyer's Division president Anna Romanskaya discusses her journey through law school and her struggles finding work as a legal practitioner. Fabiani Duarte invites guest host Amanda Joy Washington to sit down with organizer, law student, and activist Ruby-Beth Buitekant to discuss restorative justice and the Black Lives Matter movement. Guest attorney Sarah Walton takes a look at mass incarceration in our criminal justice system and how restorative justice concepts could be applied. 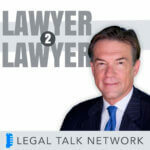 Fabiani Duarte interviews Patrick Krill about the prevalence of substance misuse and other mental health concerns among lawyers. ABA President Brown Wants You! Which ABA Sections, Divisions, and Forums Should You Join? What is the ABA Law Student Division? Kristoffer Butler is the SBA Executive President at University of Detroit Mercy School of Law.